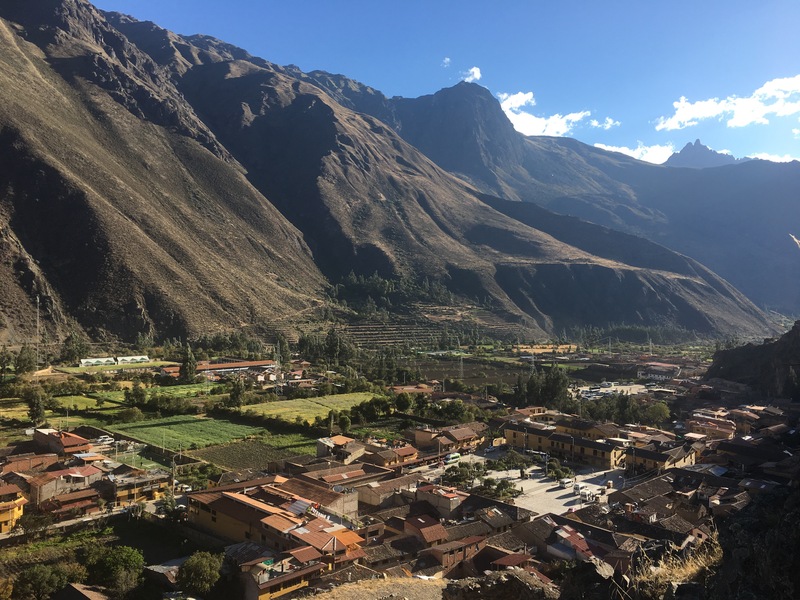 We arrived in Ollantaytambo late afternoon after a two and half hour bus ride. Kantu our CEO/guide explained that it was one of the last Inca cities left still inhabited. It served as a city on the way to Machupicchu particularly for its farming goods like corn and wheat. We checked into our courtyard hotel and went for a walk around the town. Inca stone houses still stood as did their fresh water irrigation system that ran along the roads – now its more decorative but at the time it was revolutionary. 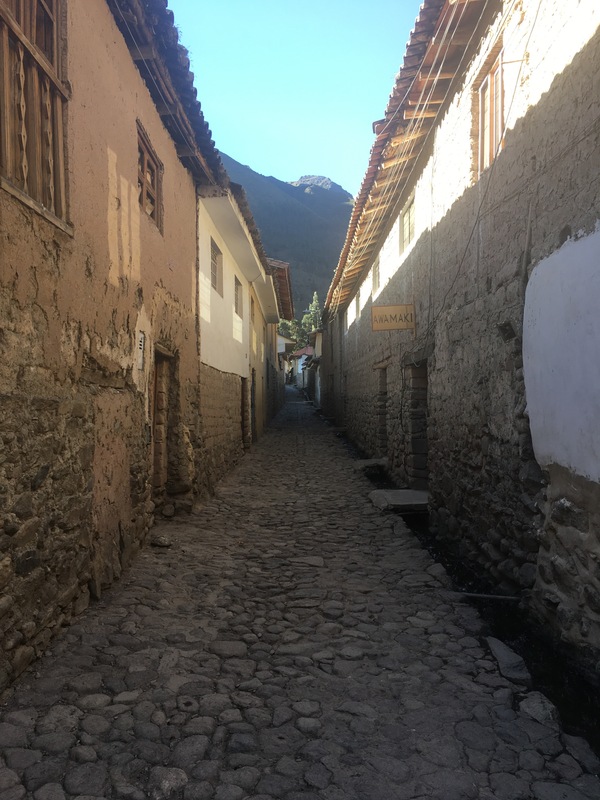 Narrow streets gave picturesque views and Inca ruins could be seen on the surrounding mountains. After a short walk through the town we walked up to some of the Inca ruins. A pre Inca trail test if you will. The path was steep and rocky. Mike stopped half way while a few of us carried on up. 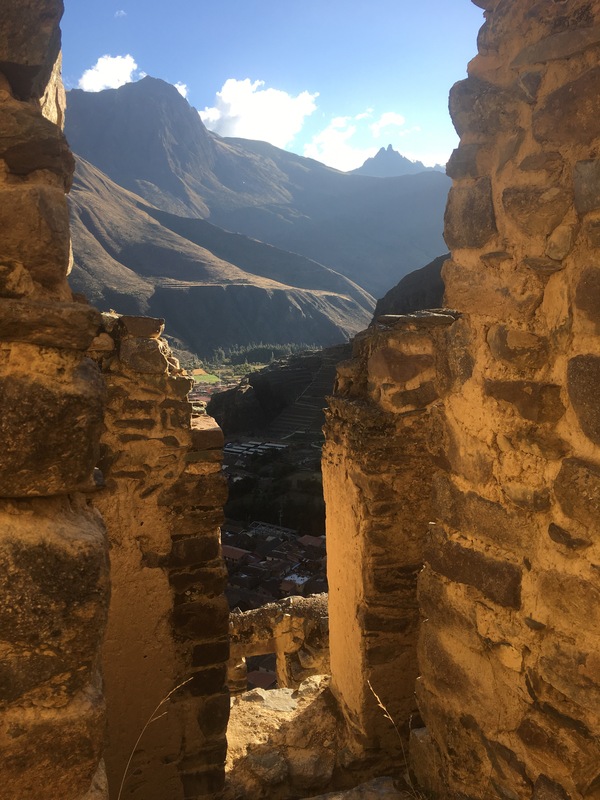 We reached an Incan grain house which made for good photographs. Apparently building it on the side of a mountain was a good way to keep it fresh, although how they got it up there must have been difficult. We took some photos on top and looking down at the town and mountains. Across the other side of the valley you could see where the nobility used to live and the remains of the sun temple. Steep steps and terraces led up to the top and crowds of tourists could be seen swarming all over like little ants. The way down was treacherous and some steps were double height. If this is what the Inca trail was like we were in for trouble. Half way down Mike was waiting for us and we continued into town. Stopping in the main square we bought a few more provisions for our trek the following day (mainly water) and headed back to the hotel. In the evening after a quick nap we went out for a group dinner before we all separated off onto our treks. 5 of us were on the Inca trail and the other 12 were on the Laras trek (another trek in the same area). Back at the hotel, we reweighed our bags (2.5kgs only) and got an early night ready for 4 days of trekking.